If I Do 100 Jumping Jacks With Weights Can I Lose Weight? Iron weights that have been stored or unused for long periods of time can develop rust, making them unsafe to use. Even so, this doesn't mean you should toss them in the trash, sell them in a garage sale or buy a new set. Several cleaning methods are available to help you restore your weights to a like-new and usable condition. Though not difficult, the rust removal process may end up being a trial and error process. If one method doesn't do the trick, try another. Spread a drop cloth or several pages of newspaper over your work area. This protects the surface from any cleaning produce spills or rust residue that may be created during the cleaning process. Put on rubber gloves to protect your hands. Take your weights and a wire brush outside to a water supply with a hose. Hose down the weights and scrub them with a wire brush to remove any dirt and surface rust, and to prepare them for a detailed cleaning. Be sure to scrub the outside edges and inside the holes. If your brush won't fit in the holes, apply coarse-grit sandpaper. Rinse the weights and immediately wipe them with a clean rag. Once dry, take them back to your work area to tackle the hard-to-remove rust in and around any lettering and crevices. Place the weights in a large galvanized bucket and pour carbonated cola drink, which contains phosphoric acid, over them. Completely cover the weights with the liquid. The acid helps dissolve any remaining rust. Allow the weights to soak for three to four days, and swish them around in the liquid daily. Rinse the weights and remove any stubborn rust with your wire brush. After a final rinse, wipe them dry with a clean rag. If you've removed all of the rust, skip to Step 4, otherwise try the vinegar method. Pour equal amounts of white vinegar and water into your bucket. Submerge the weights in the mixture and allow them to soak for three days. Rinse the weights and remove any stubborn rust with the wire brush. Rinse again and wipe the weights dry with a clean rag. If you've removed all of the rust, skip to Step 4; otherwise try using a rust dissolver product. Apply a coat of rust dissolver to the rusty areas with a paintbrush. Allow the product to sit for 20 to 30 minutes, or as directed by the manufacturer, to work away at the rust. Rinse the weights and wipe them dry with a clean rag. 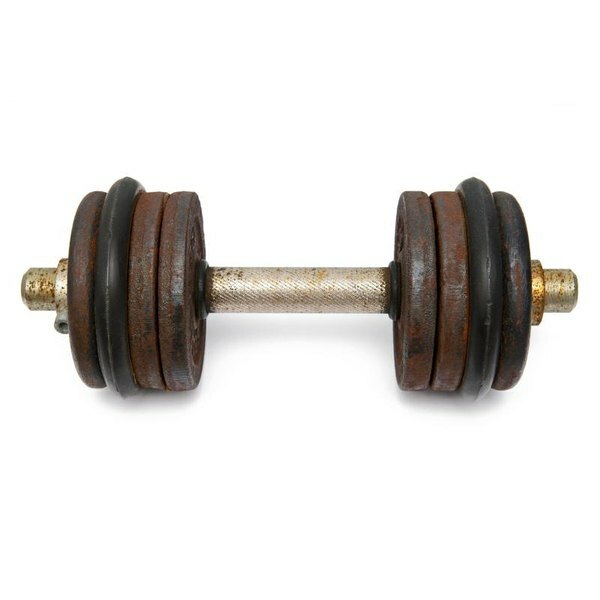 Apply a generous amount of 3-in-one oil to a clean rag and wipe down each weight to protect it against future rusting. Allow the weights to sit 30 minutes and then wipe them again with a clean rag to remove any excess oil. Spray paint the weights to further protect them from rust. Apply a spray paint with primer and allow your equipment to thoroughly dry before use.